The name Barrenhart derives from the band’s origins in Barren and Hart counties. 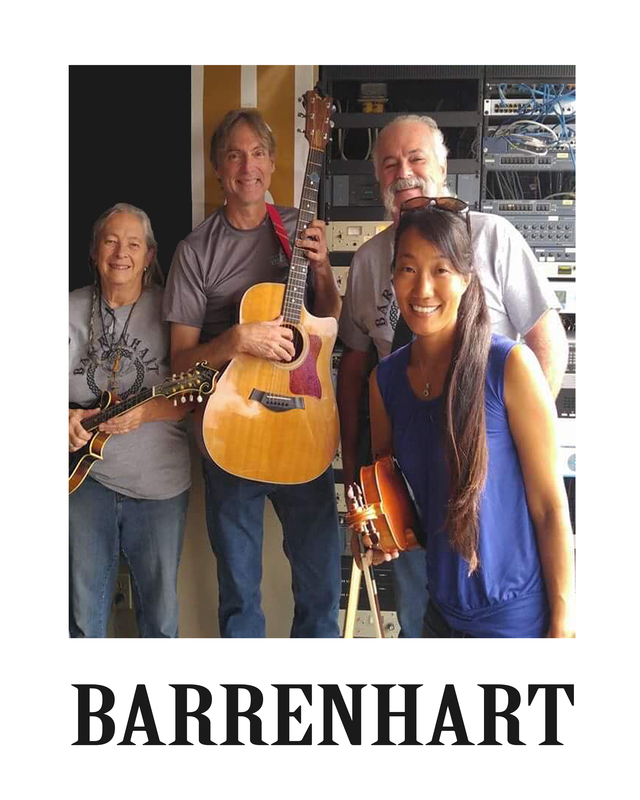 Barrenhart is Hazel Johnson on mandolin; Masako Yamashita Jeffers on fiddle and piano; David Foster on guitar, piano and vocals and Greg Cutcliff on bass, bagpipes, chanter and vocals. Barrenhart’s Celtic Bluegrass combines instrumental mastery with a deep knowledge of traditional folk music. 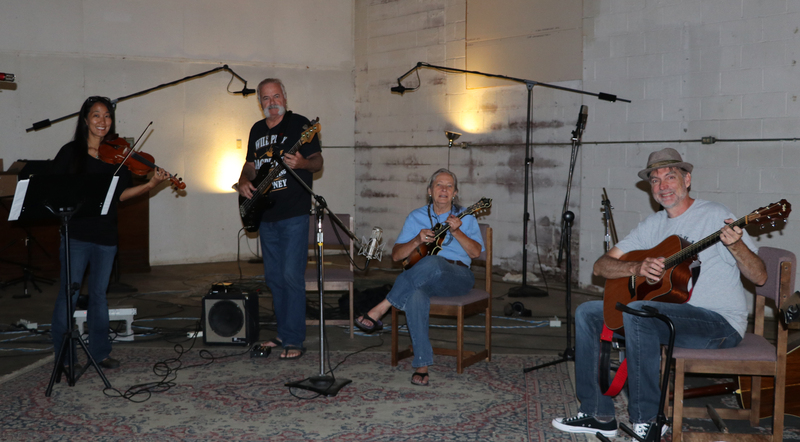 By a quirk of fate, these four eclectic musicians originating from all parts of the globe, live within ten miles of each other in rural Kentucky. Hazel is a mandolin and guitar player who was born in England and grew up in Kenya. Hazel learned classical guitar at the East African Conservatory of Music. While in England she ran the Cambridge Folk Music Festival, one of the longest running folk music festivals in the world. In 1969, she came to America and befriended Norman Blake and Sam Bush. She met her husband Courtney Johnson of New Grass Revival fame and toured with New Grass, Leon Russell and Norman Blake. She also recorded sessions with Johnny and June Carter Cash, including June’s grammy winning CD Press On. Hazel lives in Barren County, Kentucky in the heart of New Grass country. Greg grew up near Cleveland, Ohio. His father was a Clarinetist and Greg learned to play multiple instruments early in life including the guitar, clarinet, French horn and saxophone. Greg began playing the bagpipes in 1982 and has since been a fixture at Highland Games throughout the nation. He has been performing for more than 30 years and has performed with the Nashville Pipes and Drums and on recordings by Michael W. Smith and Amy Grant. Greg lives in Barren County, Kentucky. David is a guitarist, pianist and fiddler from Galax, Virginia, the old time mountain music capital of the world. Dave grew up playing folk music, old time songs, and minstrel era tunes he learned from his father, a Chautauqua tent show performer in the 1920s. Dave has a degree in classical music theory but his love is for folk music and songwriting. Dave was guitarist and founder of the new grass style band Soulgrass and for the past 30 years has been the Director of the American Cave Conservation Association. Dave lives in Horse Cave, Kentucky. Masako was born in Ashiya, Japan. She learned classical piano at age 5 and violin at age 11 before coming to America in 2002. She switched her style from classical to bluegrass and in 2006 won 1st place at the Granville (Tennessee) Fiddle Competition. She has worked as a session musician in Nashville, Tennessee and is a certified Mark O’Connor Method teacher. She now operates a family farm in Metcalfe County with her husband and two children. 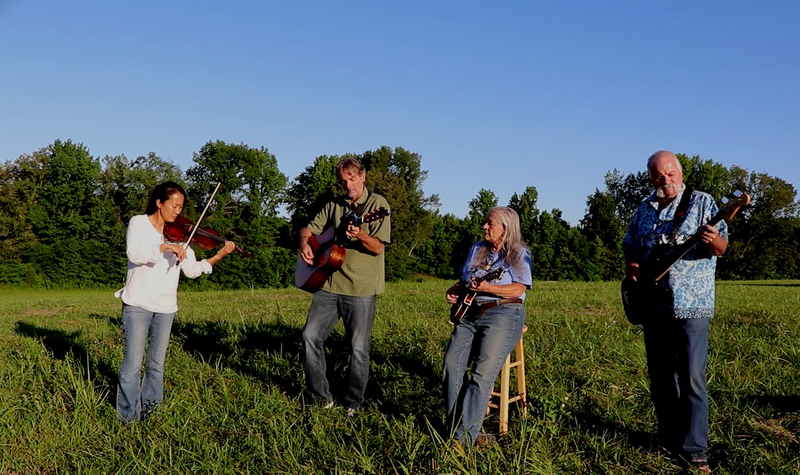 Barrenhart is a four piece string band from Southcentral Kentucky which plays traditional celtic, old time and bluegrass music, as well as their own tunes. 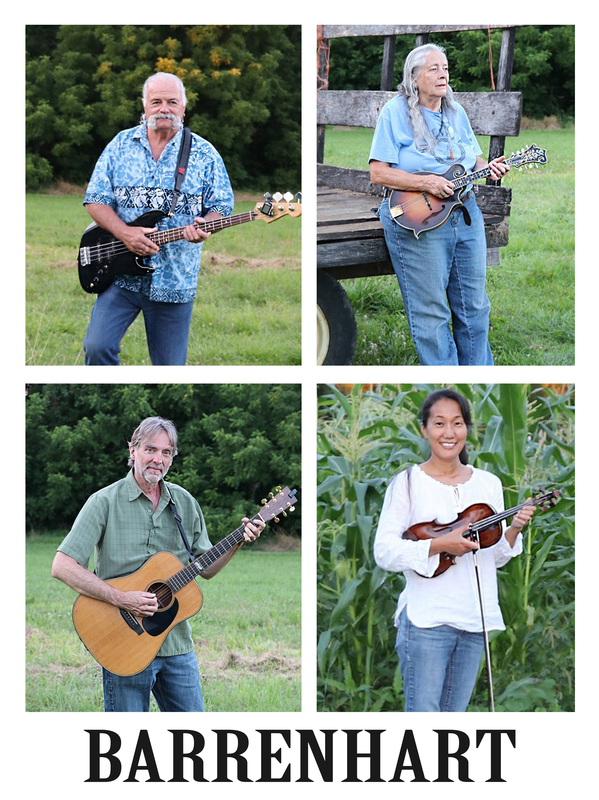 Barrenhart is made up of Masako Jeffers on fiddle, Hazel Johnson on mandolin, David Foster on guitar and vocals, and Greg Cutcliff on bass guitar, chanter, bagpipes and vocals. Barrenhart’s influences range from the old time music styles of Norman Blake to the progressive sounds of New Grass Revival. Their repertoire stretches from timeless ancient fiddle tunes to their own modern compositions. Hazel, born in England, brings a strong sense of old world music to the group. Greg’s broad Scottish voice evokes the feeling of raising a pint in a two hundred year old pub while belting out your favorite song ….and if you’re not convinced it’s an authentic voice, he will drag out the bagpipes to prove it! Dave, the ensemble’s balladeer, adds a dexterity on guitar and a deep knowledge of both modern and ancient folk music. Masako, born in Japan and trained as a classical musician, fell in love with Kentucky bluegrass fiddling many years ago. Her fiddling is the key ingredient to creating Barrenhart’s unique blend of Celtic bluegrass. The group released their first album, by the same name, in 2017. Copyright © 2019 BARRENHART - All Rights Reserved.